New Delhi: The department of telecommunications (DoT) has lowered its revenue expectations for this quarter and the full fiscal year because of the ongoing tariff war and a ban on handsets without IMEI (international mobile equipment identity) numbers, which came into effect earlier this month. The fall in revenue would be between Rs100 crore and Rs300 crore for the year to March, according to estimates by government officials, from about Rs13,000 crore in the last fiscal. 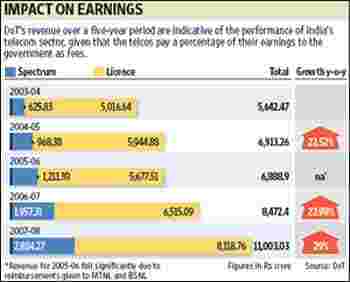 Telcos in India pay the government a percentage of their adjusted gross revenue (AGR) under the unified access service licence agreement, besides for spectrum allocation. The companies pay between 6% and 10% of AGR as licence fee depending on where they operate and 2-6% as spectrum usage charges. “The factors that are causing the fall include the ongoing tariff war," said a senior official, who requested anonymity as he is not authorized to speak to the media. “Another issue that has come is the disconnection of some 20 million handsets due to the ban on phones without IMEI numbers that came into effect this quarter." DoT had passed an order banning such sets from 1 December. According to the Indian Cellular Association, India had almost 25 million handsets without legitimate IMEI numbers, a 15-digit identity code unique to each phone that acts as a security measure. “The bulk of these have been disconnected on 30 November," said another DoT official, who also spoke on condition of anonymity as he’s not authorized to speak to the media. Some handsets have been given genuine IMEI numbers. The Essar Group-promoted mobile phone retail chain known as the MobileStore said it distributed around 30,000 IMEI numbers by the time the ban came into effect. India sells about 10 million handsets every month. “There have been tariff wars before, but then the additions in volumes made up for the loss in revenue," said the first DoT official. According to the second official, earnings of telecom companies slowed to a growth pace of 17-18% last year, from the previous year’s 29% growth. This fiscal, the rate of growth is expected to decelerate to 4-5%. India’s telecom sector has been seeing a revenue slowdown, while the number of subscribers has been increasing significantly on the back of falling tariffs and new operators entering the market. The monthly Arpu (average revenue per user) for India’s telcos has been steadily declining as tariffs drop. In the GSM category, Arpu went down by 10% from Rs205 in January-March to Rs185 in April-June, while in CDMA—where it was already low—Arpu declined 7.2% to Rs92 during the same period, according to data from the Telecom Regulatory Authority of India. India is the world’s fastest-growing and second largest telecom market. In 2007-08, the country saw the addition of 95.98 million subscribers. In 2008-09, phone companies added around 131 million subscribers. Till October this year, India added 95.93 million subscribers to take the total to around 525 million, equivalent to about half the country’s total population.